To say it’s difficult reviewing The Boy With Tape On His Face is an understatement; because the Sam Wills experience is simply too good to put into words*. 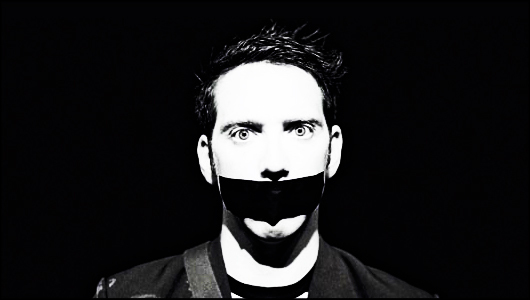 If you’re not familiar with The Boy With Tape On His Face, this is silent stand-up, mixed with elements of street-performance, mime and prop comedy. But there’s a childlike humour to it all, and Wills never takes himself too seriously – even when failing to execute a few tricks early on in the show. But despite the obvious disability, this hour of stand-up has all the makings of a typical Fringe performance. Advanced comedy techniques are employed with hand movements or slight facial gestures. There are clearly defined routines (aided by selected audience members), punctuated with set-ups like the bin that blurts out I Like To Move It and the snow globe that offers a great pay-off at the end of the show. And Wills provides more than enough laughs, too, in case you were wondering. In fact, the standing ovation he received at the end of the show is testament to the genius at play here. At the Fringe it’s rare for a show to please both reviewer and punter in equal measure but if you don’t enjoy Wills then you’re dead inside. A must-see act who transcends all barriers put in front of him, The Boy With Tape On His Face is one stand-up you’ll be talking about for years to come. Date of live review: Monday 15th August 2011. *I’m well aware that this is cliché territory when it comes to Fringe reviews, but it’s quite apt for a comedian who performs with tape over his mouth.